Nobin Udyokta, Md. Imran Hossain, studying his Masters in Social Work from Jessore Cantonment College, presented his business proposal at the 16th Open Design Lab on 15 May, 2014 presided by Nobel Laureate Prof. Muhammad Yunus. In 2008, Imran and his brother started their clothing business together. He has six years working experience in clothing business. After receiving the investment from GTT, he expanded his clothing factory. Md. Imran Hossain was awarded as the “Best Nobin Udyokta” from Jessore Sadar of 2016. By starting with only two sewing machines, Md. 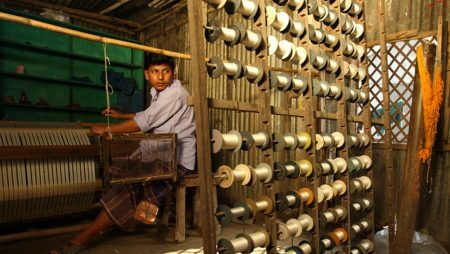 Imran Hossain now has ten sewing machines and a small factory. He himself manufactures his product & GTT has also created a marketing linkage for his product through “Grameen Poshra”-an online marketing platform of GTT. His monthly income has increased significantly from BDT 6,000($ 75) to BDT 20,500($ 256) after the investment received from GTT. The business which started with BDT 290,000 ($3,625) is now worth BDT 670,000 ($ 8,375). He has also created employment opportunities for 12 people by recruiting them for his clothing business (7 men and 5 women), thus fulfilling the main objective of NU program of creating jobs rather than job seeking. Currently, he extended his business with handicraft items and trains local women to produce handicrafts & sells them directly from his house. Besides, his success in clothing business Mr. Imran dreams to establish a successful handicraft business in the near future. Nobin Udyokta-NU (New Entrepreneur) Program is a youth-entrepreneurship development program for the next generation of Grameen family to turn unemployment into entrepreneurship.